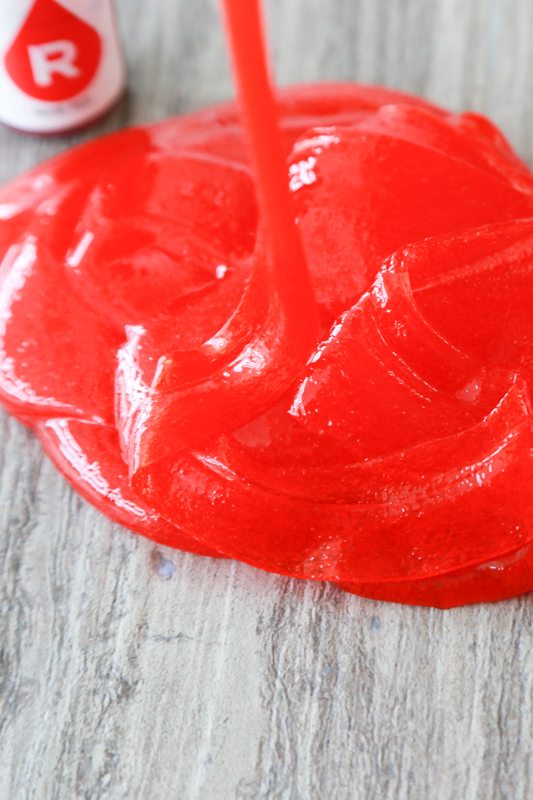 Blood Slime – the perfect slime for Halloween. 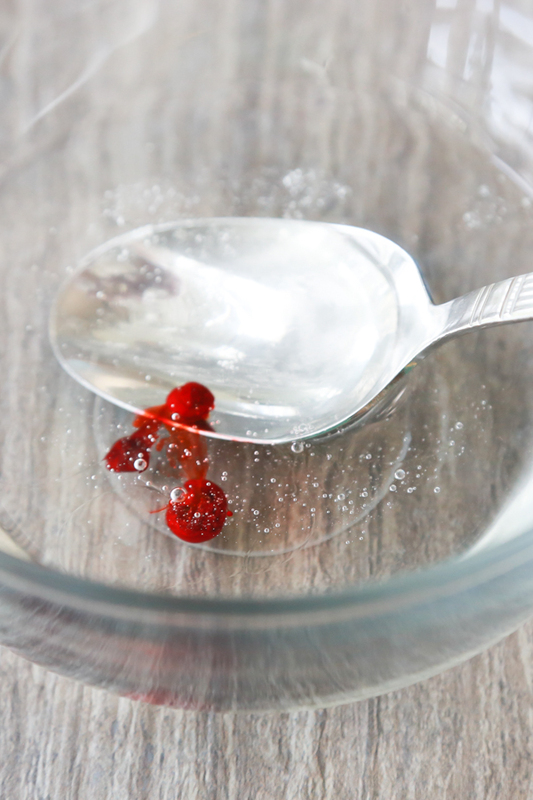 This easy to make slime that looks like blood is a little disturbing, but it’s so much fun to play with. 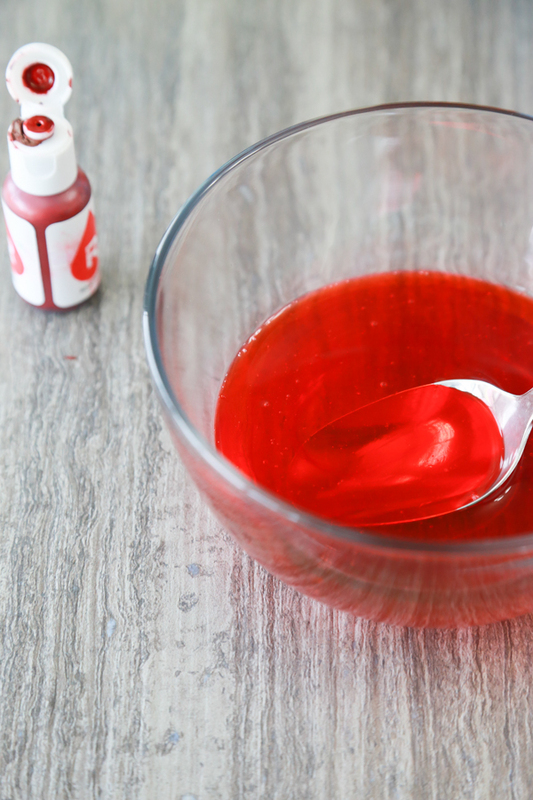 If your children love playing with slime as much as mine do, then they’ll love this super easy to make Halloween Blood Slime. Now that Halloween is right around the corner it’s time to get out all the creepy, spooky things you’ve had hidden in the attic for the last 11 months. If you want to get your DIY on this Halloween season, this Painted Spider Vase or this Spider Web Vase are both super easy to make and will last for years to come. But lets get back to this spooky Blood Slime. 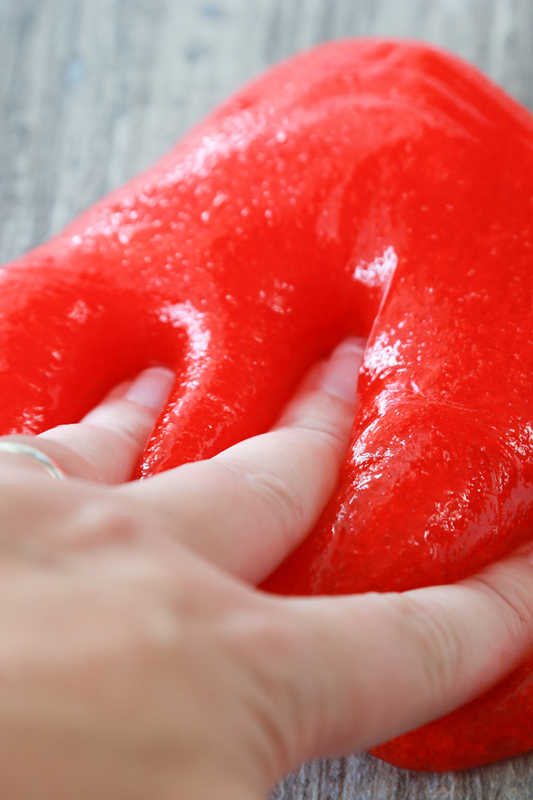 With just 4 ingredients you probably already have on hand at home, you can make this Halloween Blood Slime for hours of fun sensory play. 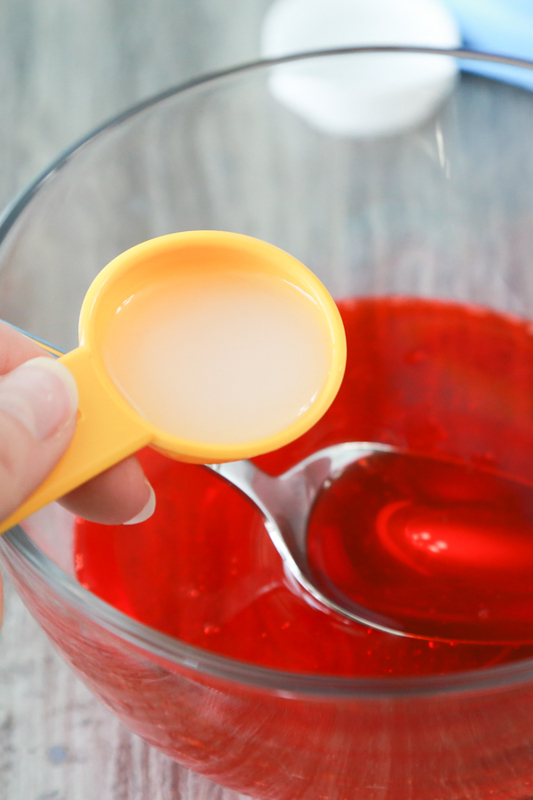 If you’ve made slime before, you’ll find that this Blood Slime recipe is a traditional slime recipe with liquid starch, only I added a little bit of water to thin it out some. This slime recipe is the first time I’ve added water to slime but thankfully it works out just fine. 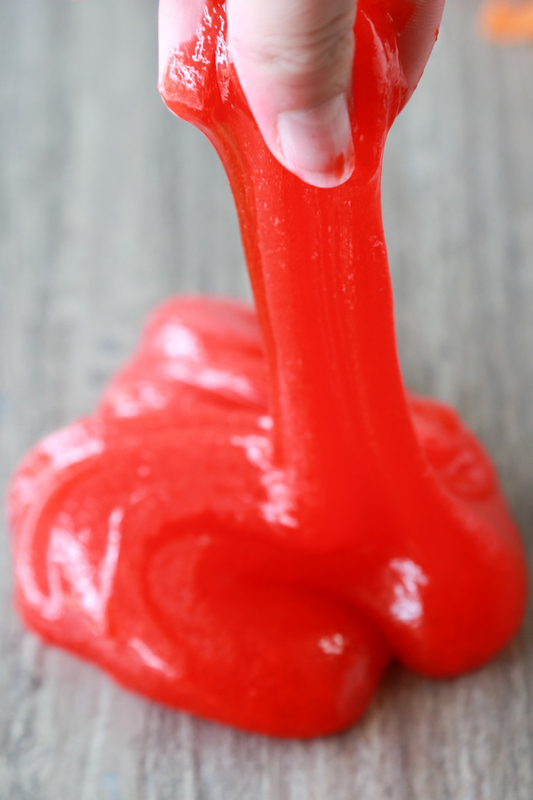 If you are making slime with younger children that put everything in their mouths, please watch them carefully when making Blood Slime. 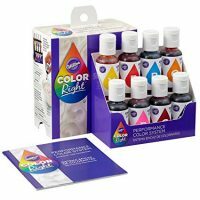 It does contain liquid starch and should not be put in the mouth. If you want a safer alternative, this Edible Marshmallow Slime might be a better option for younger children. 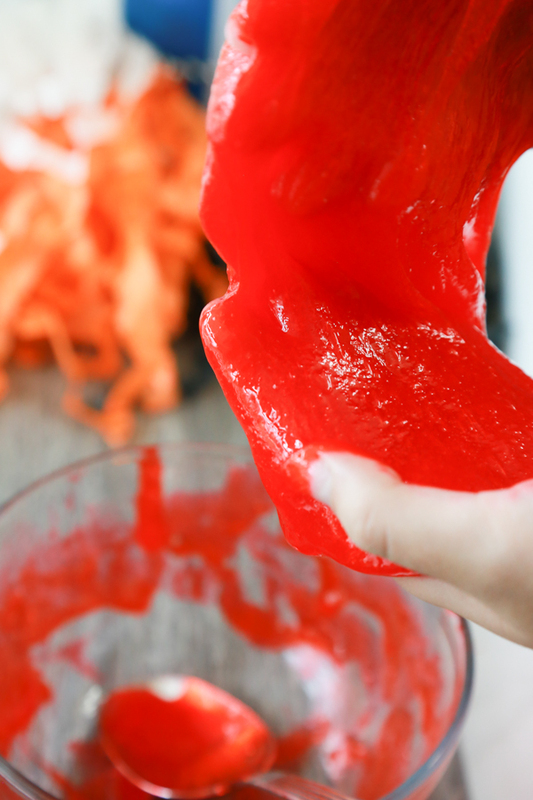 Tip: When making any type of slime it can get messy really quickly. I recommend wearing clothes that you don’t mind throwing away if necessary. Especially when making Halloween Blood Slime. The red food coloring will not come out of clothing so play clothes are the way to go. 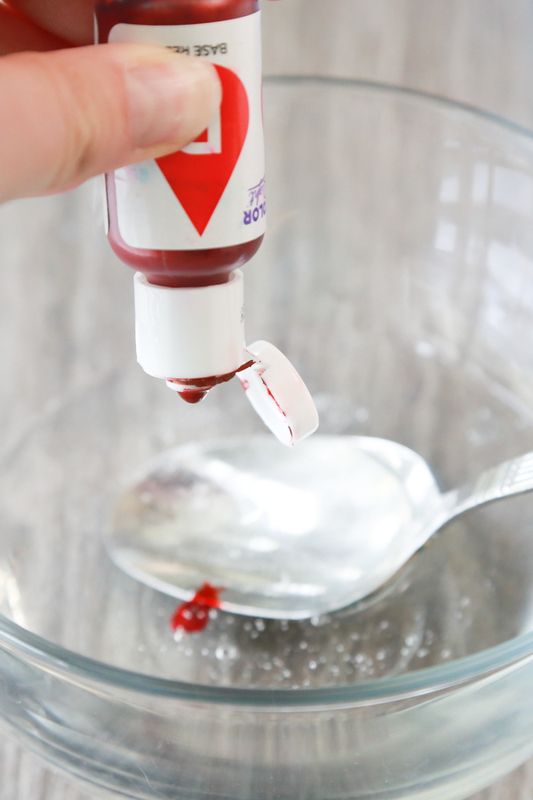 With ingredients you probably already have on hand and this easy to follow tutorial you’ll know how to make blood slime in no time. You ready? 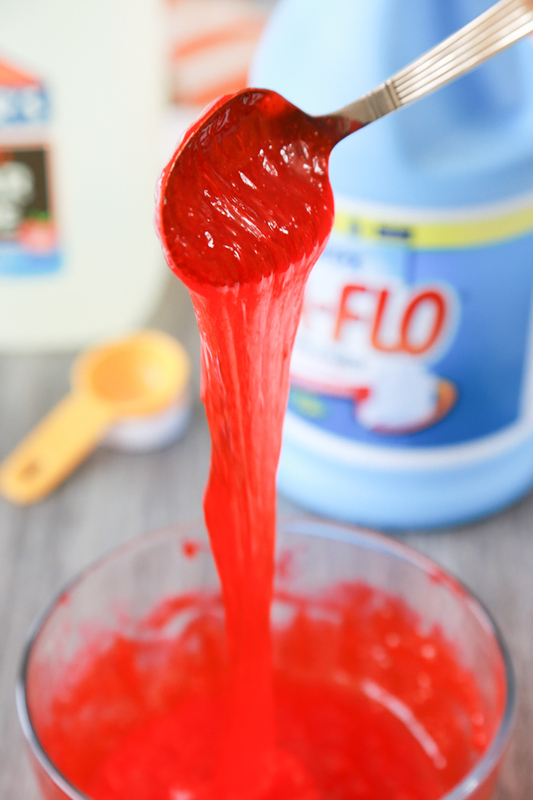 To start making Blood Slime, you’ll need to pour the glue and water into a stain-proof bowl and stir to combine. I like to use a glass bowl, but feel free to use whatever you have on hand. Once you notice the slime forming and sticking together, remove from bowl and knead with your hands. At first the Halloween Blood Slime will be VERY sticky. Keep kneading. 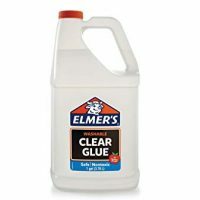 If it’s just too sticky, add a little more liquid starch in small increments until it easily pulls away from your hands. 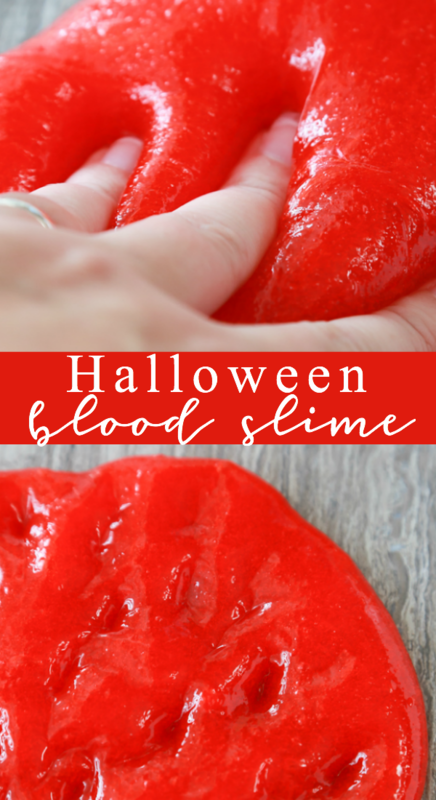 Don’t forget to pin this Halloween Blood Slime to your Halloween board on Pinterest so that you don’t lose it! 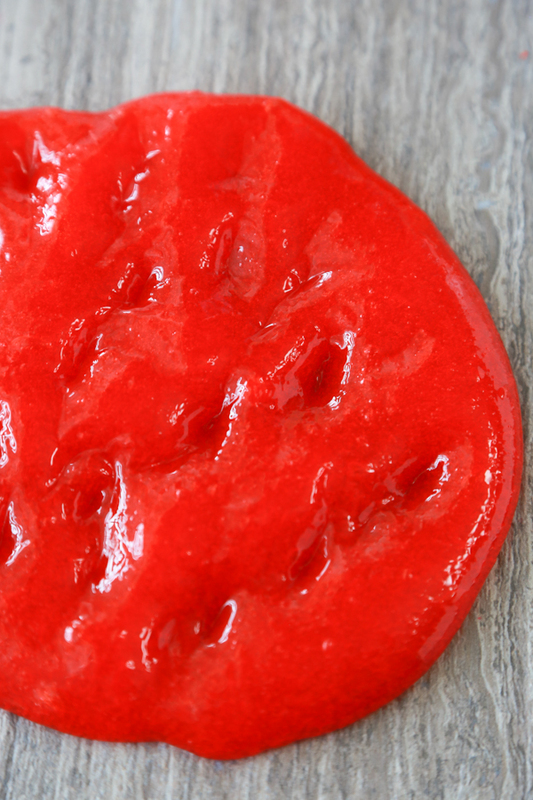 For creepy cool fun, turn clear glue into Blood Slime for Halloween. Pour glue and water into a bowl and mix well. 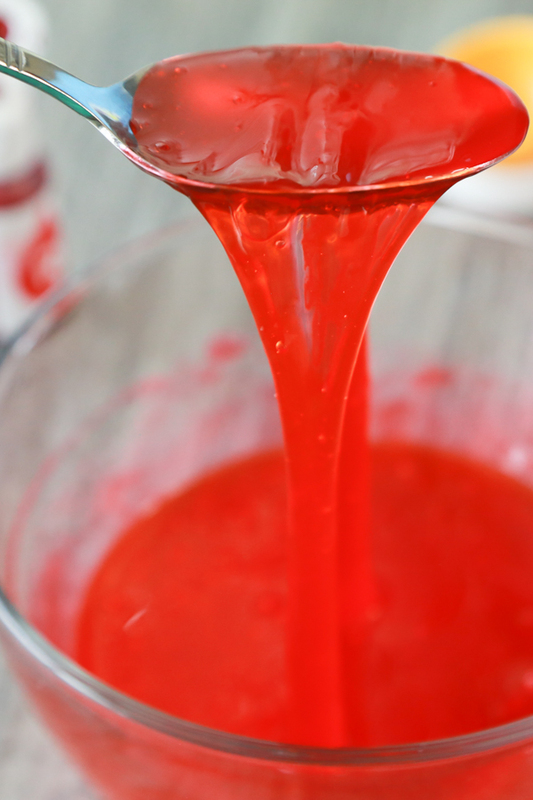 Add red food coloring and stir until fully incorporated. Add your liquid starch a tablespoon at a time, stirring between additions. Once you notice the slime forming and sticking together, remove from bowl and knead with your hands. At first it will be really sticky. Keep kneading. 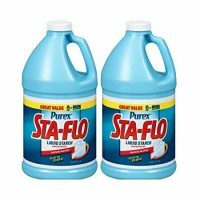 If it's just too sticky, add a little more liquid starch in small increments until it easily pulls away from your hands. Store in an airtight container. I like using little glass jars. Do all of your mixing in the bowl. Do not try to knead with your hands until the slime is forming a ball and sticking to the spoon while stirring. If you try to take it out too soon it will be so sticky that you won't be able to do anything with it. Oh boy… I’m betting my daughter would be creeped out by this, but of course my son would absolutely love it. He’s such a typical boy with his love of creepy gross stuff, lol.